The Pacific Northwest is home to a great deal of geographic diversity, including sheer coastal cliffs, towering mountains, and lush rain forests. One constant is the region's regular drizzle, so Northwest roofing materials should be tough when it comes to wet weather. Northwest roofing materials can be subjected to 8-10 months of consistent, light rain each year, and this temperate climate, with its foggy grey mystique, tests all roofing materials. Some Northwest roofing options, however, hold up more than others. If you're looking for the best Northwest roofing materials, then check out our guide to find the best Northwest roofing for your home today. Asphalt shingles are the most commonly used roofing material in the Northwest and the US in general. Usually, asphalt shingles are cheap and last 15-20 years in even the most trying climates. Asphalt shingles can also handle the Northwest’s frequent drizzle and occasional snow relatively well. Over time, however, their porous surface allows algae, moss, and mold to grow from stagnant moisture. This doesn’t mean a full replacement is necessary, but it does mean some maintenance in the form of brush, air, or water-powered cleaning is required. More cedar and redwood shingles (a.k.a. “shakes”) are installed in the Northwest than in other regions. While the Northwest economy is not as lumber-heavy as it was in decades past, it is still significant enough to make wood an affordable Northwest roofing option. In addition to its affordability, many consumers find it more visually pleasing than asphalt, more in line with regional tradition, and more “natural” looking. These beliefs positively impact the perceived value of wooden roofing materials and the value of the structures on which they rest. 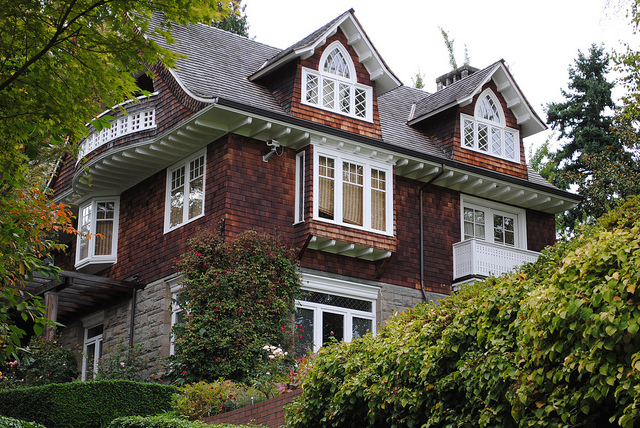 Wood shingles generally cost more than asphalt but can last up to twice as long if properly maintained. As any Northwest roofing expert will tell you, wooden roof maintenance is vital. In a moist environment like the Northwest, wood shingles are susceptible to algae and rot. However, water resistant coatings can prolong the lifespan of wood shingles and reduce the need for maintenance. Many Northwest roofing experts have long sworn by traditional, “standing seam” style metal roofs. These roofs, usually made with steel, are comprised of interlocking panels that are seamed together. The use of metal is increasingly popular due to new styles that are made of metal but resemble other roof types like wood shakes and clay tiles. Whatever the specific look, metal materials cost more than asphalt, but they are very low-maintenance and can last up to 50 years. Additionally, metal roofs can stand up to the most extreme weather patterns and are very moisture resistant. This moisture resistance makes metal an ideal Northwest roofing option. This guide does not cover every Northwest roofing option, but it details some of the very best roofing materials on the market. When deciding on Northwest roofing materials, it's important to consider the region's temperate and mostly rainy climate and choose materials that will withstand frequent rain. To find the best Northwest roofing material, be sure to check out our database of contractors today.